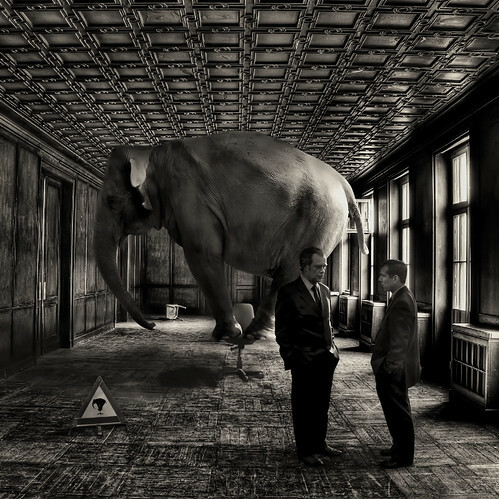 When we spot and elephant in the room, or an undiscussable topic that isn’t being addressed, it is tempting to tackle it head on. However, just naming the elephant or telling people that they’re not discussing an undiscussable topic is rarely a productive approach. The team had talked about a problem and had decided to hold a workshop to focus on that issue. Kelly, the external consultant, saw a problem that no one was mentioning. There was general agreement that people hadn’t shown up for the last workshop. After some discussion the team decided “let’s not have a workshop then” and the meeting ended. I think Kelly’s intention was honourable – how can I get the group to start discussing things to better understand the cause of problems and ways to avoid them in future. However, in this scenario, Kelly didn’t get what she wanted – rather than get to the cause of their problems in the past, they just decided to bypass these issues and cancel the workshop. Unfortunately I think Kelly’s behaviour may have contributed to the results she got including the unintended consequences, such as possibly reducing the chance that the team would feel comfortable talking about ‘undiscussable’ topics in future. There are several possible problems I see with Kelly’s approach. Unclear intent. Kelly raises the issue of the groups not mentioning that no-one attended the previous workshop, but she doesn’t state what her intention for mentioning it was. If you are not explicit about your intention for saying something then people will automatically invent their own reason, which may not have been what you wanted. Negative assumptions about others’ motives without providing evidence. When Kelly makes the claim that there’s an “elephant in the room” it could be interpreted as her saying that the group were all aware that no one turned up to the previous workshop and that they were all deliberately not mentioning it. Kelly doesn’t provide any evidence that others are all aware of the issue, or that they have made a deliberate decision to avoid discussing the issue. Kelly’s claim is high on the ladder of inference. Making an assumption about someone else’s motive, such as thinking “this group is deliberately not talking about a problem they know to exist” is an example of an attribution. Making negative attributions like this without providing evidence can mean that people feel confused or unjustly accused. Once people feel accused then it increases the chance they will respond defensively or withdraw from the conversation. No curiosity about how others see the situation. Kelly states her view to the group but doesn’t ask whether they see things the same way or see it differently. I’d assume that Kelly was acting as if her view was obvious to others. Since Kelly asked no questions about how others see the situation and expressed her view in a definite way, it reduces the chance that others will offer their view or that Kelly would find out if others saw the situation differently. Let me know your view in the comments. Another neat post. I’d like to help it improve just a bit in one regard: Understanding your (explicit) intent in writing this post would help me engage with it more completely. I get the sense that you found my intent confusing or unclear. My intent was to highlight how directly addressing ‘undiscussables’ often creates unintended consequences and to test some suggestions how to avoid these situations with readers of the blog post. If you could help me understand how what I’ve written contributed to your reaction, or how I would be clearer I’d appreciate it. Would you be willing to say more?